A full-featured and highly customizable front end that enables users to manage their orders for trading, execution viewing and routing. The one front end is used for trading all type of securities. 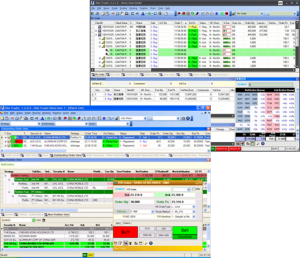 EliteTrader is our next generation Trading System tailor-made for demanding traders who serve institutional clients. This product offers extreme stability with an excellent track record of 0% production downtime since initial roll-out. 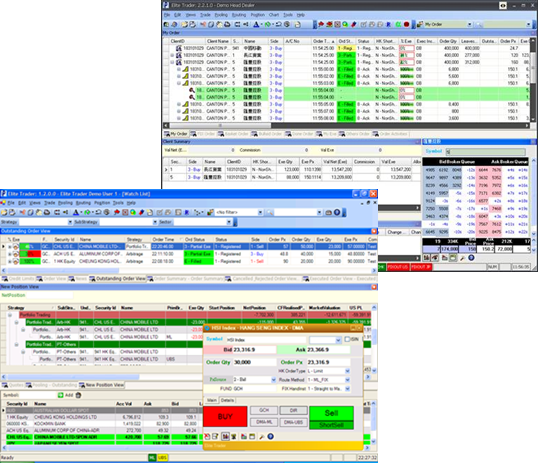 Embedded Market Depth trading with mouse trading features. Fully customizable and multi-instances of order entry / update dialogs. Support standard window style copy and paste (of order) operations to and from Excel. Tag based order viewing with dynamic sorting and tag addition / removal. Multi-lingual display (via tag labeling, no code change required). All frequently used functions accessible by short-cut keys. Conditional style coloring on views to emphasize user defined conditions. Audible alerts based on user defined conditions. Multiple displays per workstation support.